Spread a little positivity with this pretty 25mm Vegan Button Badge. Light purple with pink, green and blue writing saying, Peace Love Vegan. 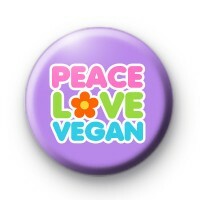 It is a great badge to give to any Vegan friends or for you to pin to your coat, jumper to spread the lovely Vegan vibes! Veganism is all about a positive lifestyle, for your health, the planet and of course the animals and our huge selection of Vegan and Veggie badges are a nice way to voice your views and beliefs.